It’s the tappiest show in town as West Coast Tap Dance Collective brings together top tap dancing talent for a one day show celebrating the art of tap dancing. Tap That! hits the wood at New Westminster’s Massey Theatre on Sunday, May 24 at 7 pm. This nothing-but-tap dance show features some of the best dancers in Western Canada, both amateur and professional. This year’s guest artists include the walk of famer Jim Hibbard, Santa Aloi, Calgary’s Danny Neilsen and the Urban Tap Squad and more than 25 dance studios from Metro Vancouver and Vancouver Island. The show ends with an invitation to the audience and performers to join in the traditional tap step – the shim sham shimmy. Kol Halev will be performing a lively number called the “Paatch Dance” or clapping dance. It’s a traditional 1940’s wedding dance. Each year, WCTDC honors one of the legends of the art of tap dancing. This year’s honoree is the late great Grace MacDonald. Legions of performers benefited from Grace’s tutelage and choreography during her years at MUSSOC, Theatre Under The Stars, and running her own dance studio. A true pioneer of dance in the Lower Mainland, Grace ‘s contribution continues today through the Grace McDonald Award scholarship given annually to The Most Promising Dancer in TUTS. Tap That! is hosted by Vancouver’s own Jeff Hyslop. A short documentary film about Grace MacDonald by Shel Peircy of Infinity Films will complete the 2009 celebration. If you knew Grace as a friend, colleague, teacher, or choreographer, or are simply a tap dancing fan, you are invited to share in the celebrations. A mix and mingle gala follows the show and will provide an opportunity to share memories, connect with old friends, and talk Tap. Tickets for Tap That! are $20/$15. Purchase on line at www.masseytheatre.com or by calling 604 521-5050. 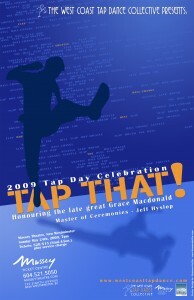 Visit the West Coast Tap Dance Collective at www.westcoasttapdance.com.